Staff have been sent home from the facility in Cumbria. STAFF AT THE nuclear power site at Sellafield in the UK have been asked not to report to work today because of elevated radiation levels. The operator of the plant said it was operating at “reduced manning levels” with all non-essential workers asked to stay at home. The firm described it as a “conservative and prudent decision”. “This follows the detection of elevated levels of radioactivity at one of the on-site radiation monitors at the north end of the site,” it said in a statement. Levels of radioactivity detected are above naturally occurring radiation but well below that which would call for any actions to be taken by the workforce on or off the site. “We have taken this decision to focus on investigation and avoid disruption on and off the site (such as traffic disruption in the West Cumbria region). If this had happened during the working day we would just allow people to go home as normal. There is no risk to the general public or workforce. The nuclear sites is located about 180km from Ireland’s coastline. Recent studies have found that an incident at the facility would result in no observable health effects here. The British energy ministry said it has no reason to believe that the elevated levels of radioactivity were any more serious than the plant has outlined. 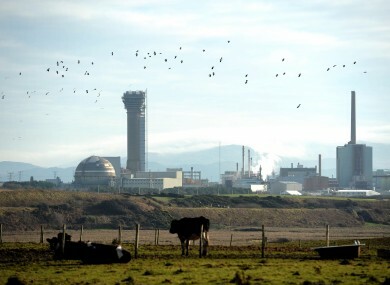 “We are in constant contact with Sellafield, but we have no reason to believe that it is any more serious than they’ve said,” a spokesman for the Department of Energy and Climate Change said. Email “Sellafield says there is 'no risk to public' because of elevated radiation levels”. Feedback on “Sellafield says there is 'no risk to public' because of elevated radiation levels”.